Many musicians, including some that are technically quite advanced, never break away from the printed page to learn by simply listening and re-creating. The common name for this process is 'playing by ear'. With some basic guidelines, any musician with rudimentary skills can teach himself or herself to play by ear, adding a new dimension to their playing skills. 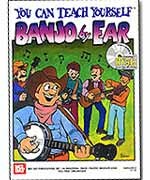 This book teaches the 5-string banjoist to listen and play solos and chord progressions by ear, providing essential ear training and techniques needed to participate in jam sessions of all types! Chapters include: Learning Chord Progressions by Ear; Faking a Solo; Playing the Melody by Ear; and Using Licks. Written in tablature only. The companion recording is in split-track format with the melody track on the left and the rhythm on the right.